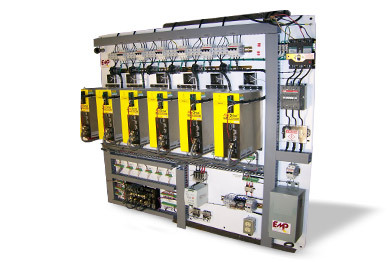 Every Multi-Axis Servo System is custom engineered for your application to maximize the advantages of Servo technology on more of your machine's functions. Minimized Setup and Changeover Times - Customers report reducing setup times by as much as two hours! Improved Efficiency - Practically eliminate wasted web. Improved Accuracy - Roll-mounted servos improve overall precision. Increased Production - Operate at speeds up to 800 RPMs. Shaftless System - Eliminate change gear stations, differential transmissions, positive infinitely variable (PIV) gearboxes, clutch units, brake units, and other drive components that are the leading cause of machine downtime. Increased Capability - Handle any web length within your chosen range without the hassle of gears. 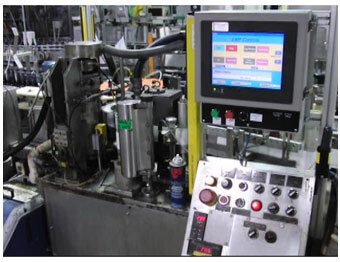 Closed-Loop System - By delivering real-time feedback, the system can interpret data and issue precise corrections. Remote Access enables us to connect to your system for monitoring and to perform software updates without requiring a field visit. Alarm Notifications - Various preprogrammed alarms not only recognize problems but also help determine particular component causing issues. Dual-Error Correction Ability - System is capable of precisely correcting both Random Phase Errors and Constant Length Errors. Sequence Setting - This feature is used to make the system follow the same pattern as the original print cylinder. It will allow your operation to run despite a poor quality printing job that results in a sequenced web. Diagnostic Software - Performs system check on components and alerts user of any issues. Touch Screen - Enables easy set-up and simplifies operation maintenance. Controller - Receives and analyzes feedback from Scanner, Encoder and Motor, and then issues precise correction to Servo Motor. Master Encoder - Provides machine speed and position of web. Mounted on a shaft with a 1:1 relationship to the machine. Scanner - Detects point of interest (registration mark, gap, splice, etc.) and supplies signal and location to Controller. The number of scanners can vary per application. Servo Motor with Gearhead - Brushless, DC motor sends and receives position and velocity feedback to Controller. Our systems utilize as many standardized components as possible. For multi-axis systems, this commonly includes using the same size motor. This approach to design allows us to easily service our systems and enables customers who stock repair parts to minimize their inventory costs. The Applications Section of our website has images of various set-ups to help further your understanding of each component's role in various operations.